A process that started on Tuesday, customers of the Microsoft Store wanting to acquire ebooks from the company will not be able to do so. A support page advises if the store category's closure, and that while customers will be able to read all of the content they have purchased from the store, they will only have until July to do so before it becomes unavailable. Pre-orders for ebooks with delivery after April 2 have been cancelled, with customers not charged and instead recommended to "pre-order at another digital book store." Microsoft also advises it will be providing full refunds for all book purchases once they become unreadable, which will roll out automatically from early July to the customer's original payment method, or as Microsoft Store credit. For customers who made annotations or marked up their ebooks before April 2, Microsoft will be adding an extra credit of $25 to their Microsoft Accounts on top of other refunds. 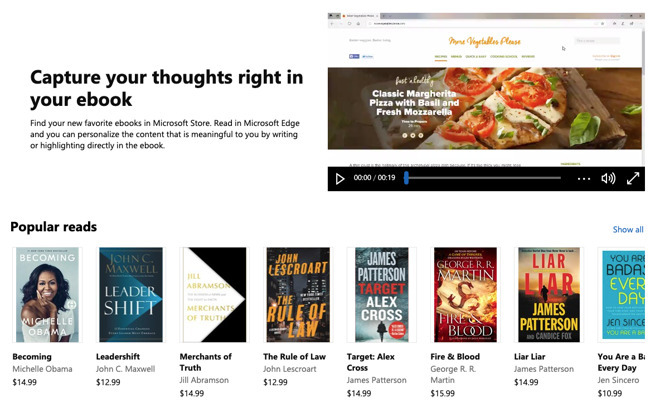 The Microsoft book store allowed customers to buy ebooks, but rather than offer them as separate downloads or in a custom reader app, the titles were instead available to read within the Microsoft Edge browser. This meant the books were also available to read on iOS and Android using the mobile version of the browser, with progress synchronized between devices to allow users to continue where they last left off. At the time of the refunds being processed, the eBooks will be removed from each customer's Edge browser. ZDnet reports Microsoft's official reason for closing the store is to streamline the focus of the Microsoft Store. It is also suggested the change could be linked to the April 2019 Update for Windows 10 or the company's change for Edge itself to one based on Chromium. Microsoft's withdrawal from ebooks arrives at a time when Apple is increasing its presence in the digital reading marketplace. The iPhone maker recently announced the Apple News+ subscription, which offers a selection of paid content from news outlets and magazines on iOS devices. The loss of the ebook store means Microsoft is bowing out of another area of content distribution, following after the departure of Groove Music in December 2017. The Microsoft Store still sells a variety of content, including movies and TV shows, alongside games and other software.